How would politics change if there was no more mud-slinging? We’re over a year away from the election and it is ridiculous. How about a requirement that we follow Jesus’ “Golden Rule.” It is never out of date or style, “Do unto others as you would have them do unto you.” It’s a rule that is pertinent to the immigration crisis in Europe and the U.S. It hits home with issues of racism, prejudice, and the general animosity we feel toward everyone that irks us. It works behind slow drivers, in front of slow clerks, and beside inattentive wait staff. We want to be treated fairly and nice, so we need to treat everyone else the same way. How would our day, life, ministry, marriage, and demeanor change if we simply follow Jesus’ advice and treat people the way we want to be treated? Consequences and ripple effects come to mind. Bad deeds reap repercussions and good ones pay kindness forward. Welcoming the stranger, immigrant, and the family outcast is an act of grace that we ourselves desperately need. No one has a corner on the market of either goodness or evil. In Romans 3:23 we get the Lord’s perspective on the universal human predicament, “All have sinned and fallen short of the glory of God.” In John 3:16 we see God’s worldwide remedy, “For God so loved the world that he gave his one and only Son, that whoever believes in him shall not perish but have eternal life.” God’s judgment on our sin is always bracketed by Jesus’ grace. Of course, it’s not cheap grace. Jesus’s death came at an ultimate cost. Reconciliation costs everyone! Following the Golden Rule is extremely difficult! To forgive an offending party is hard. Just ask the families of the Charleston Nine. I listened last night to two of the survivors and was struck once again by the magnitude of their grace. They made it clear that the only way they have been able to forgive is because they themselves have been forgiven. We can welcome the unwelcome and love sinners because there’s not that much difference between us. We all need Jesus, don’t we? The reciprocity of the Golden Rule is common to all, so why don’t we practice it? I’ve been reading a book, Cat and Dog Theology, that is subtitled “Rethinking Our Relationship with Our Master.” It makes an interesting analogy that discloses my self-centered smugness. It offers a suggestion that Christians can either be like cats or dogs. Cats are finicky and pretty much think that the world revolves around them. Dogs are eager servants and loyal to a fault. These are generalizations and there are certainly exceptions. Some dogs are mean and lazy, and some cats will purr you into a good mood with their affection. Nevertheless, the analogy is effective in convicting me of being too self-centered to follow the Golden Rule. Rather than please the Master, I often think I’m the master. I want to be a loving dog-like Christian that welcomes the stranger, and not like a cat in a room full of rocking chairs that is too scared to budge because I might get hurt. The old man replied, “I try my best to live by the commands of Christ. He told his followers not to resist those who are evil and that if someone takes your shirt to offer him your coat as well (Matthew 5:39-40). The two men listened with amazement to the man’s simple words. Then they carried everything they were stealing back into the house. As they left, the first man whispered, “Pray for us, old man.” The second one just shook his head and said, “I didn’t know there were any Christians left in the world.” Live the Golden Rule and watch how the world will change. Cats can be casual observers of life and its hardships. The world needs us to go get help. Woof! Woof! A blessing in disguise is a rare event for me, but I’ve had several this week. First we had a situation with a medicine that one of us takes. There’s never been any problem with getting it refilled, and it has been a regular medicine for years. The pharmacy, however, said it was disallowed by the insurance company. To make a very long story short, it’s been quite a saga of calling the doctor’s office, speaking to just the right nurse who could read the file, going through a committee of the pharmacy provider, getting an automated message last night that it was approved, “Yay!” and then 3 phone calls this morning to get a whopping three pills because the pharmacy has to order this med because it’s about to go generic. Whew! You’re probably asking, “What was the blessing in disguise?” In the midst of all the events surrounding this saga, it dawned on me that a med that I’ve been taking for years seemed to be running low when I opened the bottle last night. I remembered that I had talked to my doctor about a refill several weeks ago, and his nurse called me to make sure that she had the right number for the call-in prescription line. I didn’t think anything more about it, safely assuming, I thought, that it would arrive shortly in the mail. But in the midst of dealing with the other medicine situation it dawned on me that I usually would have received the meds by mail by now so I went on-line this morning and checked to see if it was on the way. It wasn’t! So I backtracked with the doctor’s office ad infinitum and called our mail-pharmacy number. Now things are straight on both meds and they’re on the way, plus the rest of the first pharmacy order should be here tomorrow. Breathe! The blessing in disguise is that if I hadn’t had a problem with the first medicine then I probably wouldn’t have remembered that the second one was delayed or noticed that it was running low. By the time I would have figured that out, I would have been out of that one, too! Blessings in disguise are hard to see when you’re in the throes of anxiety. No wonder the British Navy has a whistle they blow just before they come to “battle stations” in a crisis or emergency. It’s called “The Still.” Their thinking is that if we will pause before we get freaked out then we’ll be better able to think and handle the situation in a much more productive manner. 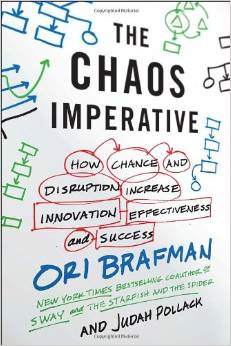 I just finished reading a book called The Chaos Imperative by Ori Brafman and Judah Pollack that makes the same point. They suggest that a little unstructured space or pausing can provide insights and innovation. They call it “white space.” White space allows us to recognize more clearly the blessings in disguise that we have written off as horrible intrusions. As Christians, we call this space: prayer, meditation, Sabbath, or doing our devotions. Whatever we call it, our times apart allow us to see God’s perspective on our anxious moments and recognize blessings in disguise. The blessing in disguise was that instead of freaking out, Cindy and I were disconnected from our cyber-lives for a blessed few days and simply sat in our den and talked and read, went to bed early, and rested much better. On top of that when the repairman did come yesterday, it not only was a very simple fix, but he and I had a very helpful serendipitous conversation about faith and hope. It became a sacred moment – all because the TV went out and we went beyond a having a hassle-filled hissy to being still. The next time I get frazzled I’m going to latch onto Psalm 46:10, “Be still and know that I am God,” and give purposeful pausing a chance. There are blessings in disguise that I need to see. How about you? “Boy, do I have an opportunity for you!” are words that most United Methodist clergy have heard or will hear during their ministry. Within the next 6 weeks this phrase will be used a lot! The difficulty is that one person’s definition of “opportunity” may not match someone else’s. It is a statement usually said by district superintendents who are on the front-line of making appointments. They are at the point of the triangle between churches and clergy, matchmakers who have on-site knowledge of their churches and ministers. This knowledge is shared with the bishop’s whole cabinet, and through shared discernment, matches are made. In the UMC system defining an “opportunity” is always a matter of perspective. It takes conferencing about the perspective of the local church and its perception of desired leadership needs; the perspective of the clergy and where they are in their ministry or the importance of family considerations; and the perspective of the bishop and cabinet who are scanning the needs of the whole annual conference and doing their very best to make disciples of Jesus Christ. Connectionalism and working together is part and parcel of United Methodism. Therefore, appointments are made by the whole cabinet, though the Bishop alone is given constitutional authority (Par. 54, 2012 Book of Discipline) to do so after “consultation with the district superintendents.” Consultation includes local churches and clergy, too, and that appears in the form of church and clergy profiles. Therefore, everyone takes a hand, not least God, in our system of clergy deployment. Staff-Parish Relations Committees complete Church Profiles that describe the church, and clergy fill out Pastor Profiles that offer insights into their situations. By the way, both need to understand the importance of a well-presented profile. Those profiles will be pored over with microscopic attention when appointments are made. Please at least use spell-check! The bishop and cabinet have a perspective about clergy and churches and the needs of the whole conference, and sometimes they have to make decisions about which only they know all the facts. Churches have their own unique perspective and rightly so if they can only count on one hand the number of effective ministers they have had in any given person’s lifetime. Clergy certainly have a unique perspective shaped by their family needs, and their sense of their gifts and graces and how they might be best utilized. So, what we have as we approach “appointment season” in the UMC is an “intriguing dance of perspectives,” a cooperative connectional effort to discern who goes where and who gets whom. I pray for all those who are feeling the tensions rise in anticipation. Being on a trapeze with one hand letting go of one bar (pastor, church, friend, etc.) and willing to trust God enough to reach out for that the next bar (church, pastor, friend, etc.) is daunting, yet potentially thrilling. Throughout the whole process, as it is bathed in prayer, we absolutely must believe that God is in this enterprise, that Jesus will be glorified, however saddened or distraught we might be. In other words, we need more than a human perspective. We must affirm that a heavenly perspective is of highest importance. In our system we yield ourselves to a scary and vulnerable process not unlike the risk Jesus took in his incarnation. So the word is “Perspective,” both divine and human. This is the essence of our belief in the system we call “itineracy,” the moving of clergy. John Wesley called itineracy the “apostolic plan of evangelization.” He thought that our “sent,” not “called” system was and is one of God’s best ways of mobilizing and energizing God’s salvific plan for humanity. I agree and have yielded myself to our peculiar process. Trust me, I haven’t always seen the wisdom of the bishop and cabinet, nor have all of my appointments been rosy. I do know this, however, that God has provided for me, my family, the local church, and the community. When we yield to a divine perspective all other perspectives come into focus! Some people claim that their personal perspective is supreme and that their needs and/or agenda supplants and trumps everyone else’s. That’s not our system. I’ve seen people finagle their way upwards using manipulation and maneuvering, but, sooner or later, their solitary and self-promoting perspective will come to a halting stop. They have elevated what they want over saying “Yes!” and yielding. God help the UMC if that kind of personal aggrandizement ever wins the day. “During World War II, a general and his aide, a lieutenant, were traveling from one base to another. They were forced to travel with civilians aboard a passenger train. They found their compartments where two other folks were already seated – an attractive young lady and her grandmother. For most of the trip, they conversed freely. The train entered a long and rather dark tunnel. Once inside the tunnel, the passengers in this particular car heard two distinct sounds – the first was the smack of a kiss; the second was the loud sound of a slap. Perhaps our so-called “opportunities” are not at all what they seem, or they are fleeting chances for us to “work” the system and “slap” the “Man” by bucking authority. We better be careful not to be so creative in our massaging the system that God’s video cam doesn’t catch us and we end up as our own worst enemy. I would rather trust the communal perspective of our appointment-making system than end up getting what I finagled for and be absolutely miserable. So, let’s trust everyone’s perspective, especially God’s! Everyone’s input insures a better opportunity for fruitful ministry. 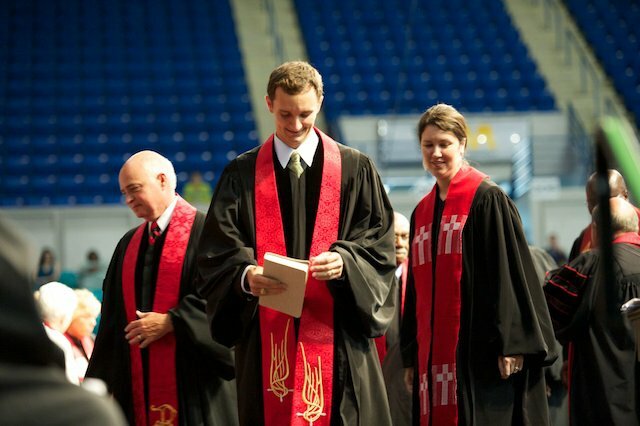 The red Stoles represent the Yoke of Christ saying that We YIELD to where we are SENT!